Most Long Island voters support a broad federal immigration reform plan to strengthen enforcement while granting legal status to millions of immigrants, according to a new poll. Eight of 10 Long Islanders surveyed said they "somewhat" or "strongly" favor a bill, which moved to full Senate debate Tuesday, described by poll-takers as a four-pronged plan to strengthen border security; require employers to verify workers' legal statuses and give "undocumented immigrants" a path to earned citizenship while increasing job visas. Did you hear the news? 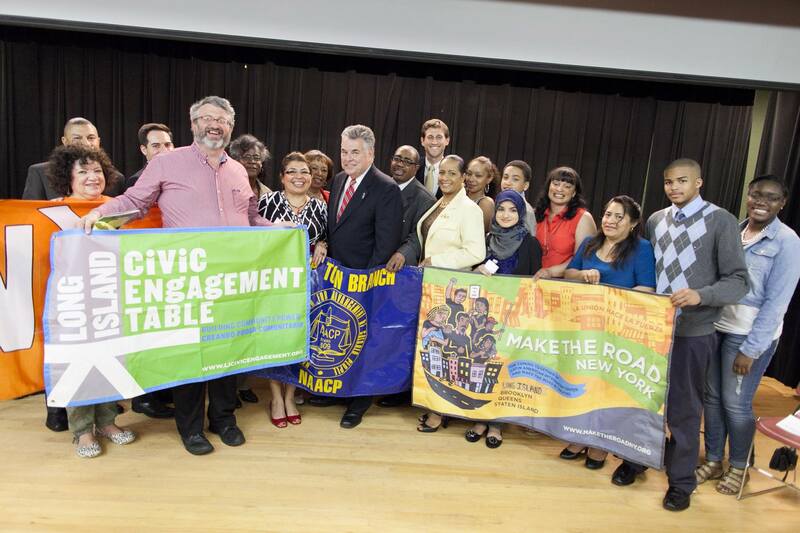 Last week the Long Island Civic Engagement Table and NAACP of Islip, joined by more than a dozen allied community and labor organizations, hosted a community forum with U.S. Congressman Peter King in Brentwood. Rep. King faced tough questions from a panel of community residents. In response to one question on immigration, Rep. King publicly announced his openness to comprehensive immigration reform, including a path to citizenship for undocumented immigrants. This is a major step forward for our movement! Click through to read Newsday's coverage of the event, and click here to see more photos of the evening on Facebook!